If you enjoy bacon or ham, chances are you’ve eaten pork from North Carolina, where about 16 million hogs—10 percent of the US total—are raised each year. The great bulk of that production takes place in a handful of counties on the state’s coastal plain—places like Baden County, home to more than 750,000 hogs but only 35,000 humans. 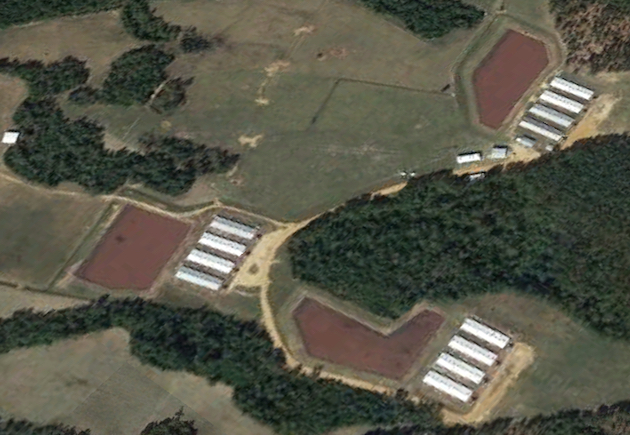 Recently, a federal jury awarded more than $50 million in damages to 10 plaintiffs who live near one of the factory-scale hog operations. The Bladen County case is the first of 26 lawsuits pending in North Carolina hog country—the next is due to begin trial this month. (Smithfield, meanwhile, has vowed to appeal last week’s court decision.) Will the legal onslaught force the industry to stop siting intensive high production so close to people’s homes? Iowa is the site of even more hog production than North Carolina, and people who live near facilities there have similar complaints. Real change, Diamond says, won’t come until governments force the industry to clean up its act through tighter regulation. But “this industry in particular has incredible influence over all levels of government,” she says. North Carolina’s state legislature is notoriously cozy with Big Pork; and as the money-in-politics tracker Open Secrets notes, the meat lobby wields tremendous power in Washington.